Ara Aprahamian's Uncle Benny launched from last to first to win the 127th running of the $150,000 Futurity on Sunday at Belmont Park by a half-length in 1:11.26 for the six furlongs on the Widener turf listed as good. As part of the Breeders' Cup “Win and You're In” Challenge Series, the Futurity victory will send Uncle Benny to the gate for the all-new $1 million Breeders' Cup Juvenile Turf Sprint Division at Churchill Downs on November 2, known as “Future Stars Friday,” as one of five races for 2-year-olds. Now perfect through two starts for trainer Jason Servis, the Declaration of War colt has a victory on both dirt and turf. From the gate, the early pacesetter was Joyful Heart, who found himself on the lead for the fourth straight time in his career, continuing his streak through a first quarter in 22.46 seconds down the backside while Veterans Beach and Bizzee Channel kept him company early. Soon, Real Money stalked from a length behind as the field situated itself behind as Fayette Warrior held third with Dragic, the lone filly in the field, to his outside. Uncle Benny was last among the strung-out field of 10 ahead of him after nearly clipping heels at the break after Swamp Rat, to his inside, veered outward at the start. Rounding the turn, Real Money made a move for the lead outside the tiring Joyful Heart to his inside, as Dragic began to find her best stride after a half-mile run in 46.30. Dragic and Hall of Fame rider John Velazquez took command after five-eighths was clocked in 58.71, but to her outside was a challenge from longshot Backtohisroots, who was charging late alongside Uncle Benny, who made a strong move from last in the middle of the track. Down the stretch, Dragic was in an all-out drive, but Uncle Benny continued his progress under Irad Ortiz, Jr. who held off Backtohisroots by a half-length at the wire. Dragic held third 1 ½ lengths behind the top two and four lengths over Fayette Warrior, who finished fourth. The quick action of Ortiz, Jr. and his patience through the early run down the backstretch certainly helped Uncle Benny in the late stages of the race. “It's always exciting with a “Win and You're In” [for the Breeders' Cup],” Ortiz, Jr. said. “I'm just so happy for [trainer] Jason Servis, it's been such a good year for him. He's a nice horse. It was the first time I rode him. We had the outside post and he broke a step slow. I didn't want to rush him out of there, he's a baby. They ran away from and I just dropped in. I didn't panic. I waited and when I made the run on the outside, he took off. With the next destination set at Churchill Downs for the colt's third career start Servis and his connections have a decision to make as to which race he will start during the first weekend in November. Sent off at odds of 5-1, Uncle Benny returned $12.40 to win. 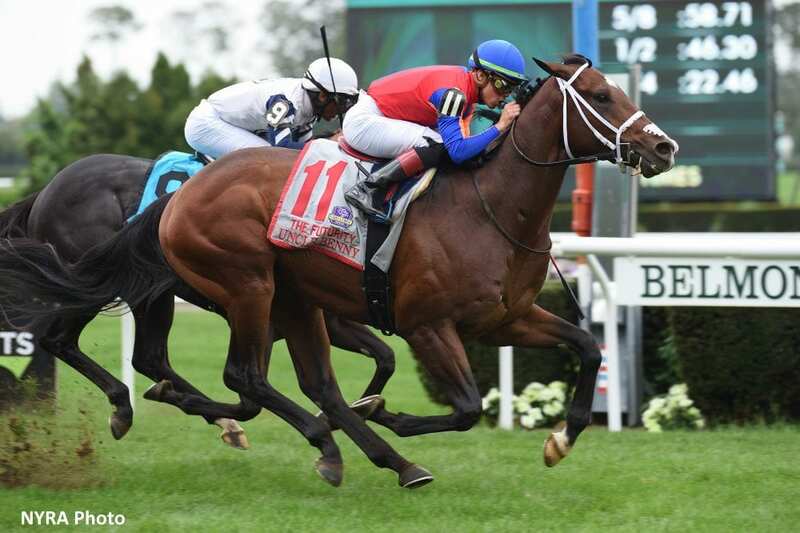 This entry was posted in Breeders' Cup and tagged belmont, belmont park, Breeders' Cup, breeders' cup juvenile turf sprint, declaration of war, Futurity Stakes, Irad Ortiz, Jason Servis, storm cat, uncle benny, win and you're in by Anthony Affrunti/NYRA. Bookmark the permalink.